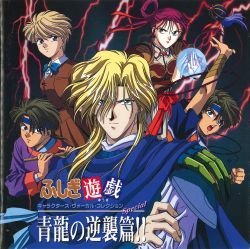 Fushigi Yuugi Character's Vocal Collection Special Seiryuu no Gyakushuu!! / ふしぎ遊戯 キャラクターズ・ヴォーカル・コレクション Special 青龍の逆襲篇!! / Fushigi Yuugi Character's Vocal Collection Special Seiryuu no Gyakushuu!! Fushigi Yuugi Character's Vocal Collection Special Seiryuu no Gyakushuu! !